Hair Material:100% Unprocessed virgin Brazilian Human Hair,Collected from One Young Donor. 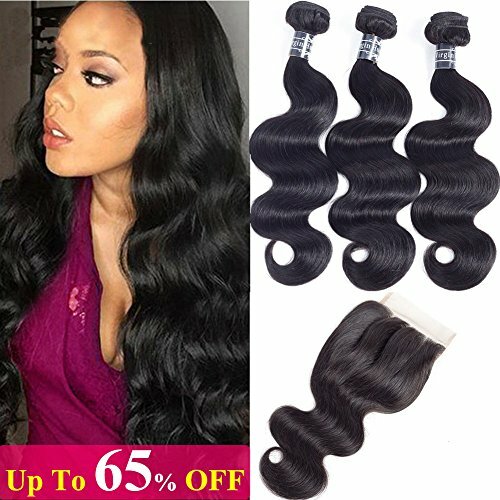 Hair Weight&Length: Full Head Brazilian Virgin Hair 3 Bundles. Each bundle is 95g-100g (3.3-3.5oz),For the length, stretching the virgin hair to be STRAIGHT then measure it. Lace material:Swiss Lace No Bleached Knots,Strong and Invisible. Closure Measurement or Length Standard: 1.Stretch Closure to Straight, and then Measure from the Top Lace to the Hair ends of Middle Part(Longest Part)2.We Suggest buying longer Lengths Closure to match Hair Bundles for better Blend between them. A: 100% Human Hair. You can tell them by burning hair and smelling. For Human hair, fulling of natural protein, it will be ash and white smoke. For synthetic hair, it will be a sticky ball and black smoke. A:It depends on your maintainance.Treat it like your own hair and take very good care of it with hair care tips,normally it could last 6-12 months. A:Yes.The hair can be colored. As a general rule it is easier to darken the hair than to lighten the hair.We recommend to dye darker,since it is difficult for the original colour to fade.Improper dying will ruin the hair.We highly recommend having your hairdresser dye the virgin hair.if you are not professional,please.go to the salon. A: Any issue about our products(refunding or returning) or service, please feel free to email us. We promise to give you a satisfactory solution at the first time. If you have any questions about this product by Amella, contact us by completing and submitting the form below. If you are looking for a specif part number, please include it with your message.